Bhadrajun is a village in the Jalore district of the western part of Rajasthan, India, dating back to ancient times of the Mahabharata epic. However, in recent centuries, it was the scene of warfare between the rulers of the Marwar dynasty and of the Mughal Empire. While the mythological history of Bhadrajun is traced to Arjuna who lived in the treta yuga, one of the four Hindu eras of Mahabharata; the history of Bhadrajun and the Marwar rulers of Jodhpur can only be traced from the 16th century. Several historic wars took place in Bhadrajun, initially against the Suri dynasty and later against the Mughal dynasty rulers. The earliest ruler who occupied Bhadrajun was Thakur Rattan Singh, fifth son of Rao Maldeo, the Maharaja of Jodhpur in 1549. It was a feudal land under the Jodhpur kingdom, which had ten land lords who were called Rajas or Thikanas, out of a total of 1,891 land lords. These ten Rajas were known as Sirayats in the State of "Jodhpur Marwar". They held high positions in the court of Jodhpur. The Bhadrajun feudatory was also one of the ten feudatories which received special privileges in the court. In the seating arrangement in the Jodhpur court, the Raja of Bhadrajun was always seated to the right of the king, since he belonged to the king’s lineage. Sixteen generations of Marwars ruled from Bhadrajun. The fort is constructed on top of the hill and although small, it was built as a strong hill fort. It is also strategically located in the village of Bhadrajun, which is also securely protected since it is enclosed in a horse shoe shape valley with one entry from the east. The fort walls are 20–30 feet (6.1–9.1 m) high, built at strategical locations around the village with a uniform width of 10 feet (3.0 m). Bastions, known as burjis, were built to erect canons and to eject arrows against invaders. The fort is built on rugged hills with forest vegetation consisting of trees, cacti, bushes and rocks. The forest around the fort is inhabited by wildlife such as jackals, wild cats, blue bulls, hedge hogs and foxes. 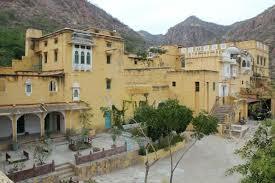 The fort has been converted into a luxury hotel, with 14 furnished rooms, all with a bathroom ensuite. ED: Give us some background information and take a moment to introduce yourself. RSG: I have done my masters in Psychology and English, guidance and counseling. Work experience: IB Board CBSE, IBSC, worked with almost all the boards. I have worked with Pathways World School, Goregaon and Raffels International School, Rajasthan as the Vice- Principal. ED: How would you describe your leadership style? ED: What are some ways you have dealt with challenges, and how did you find solutions? RSG: With calm and cool head, by listening to them and with a positive mind. ED: What advice would you give to a new teacher on his/her first year? RSG: I would tell a teacher to have a lot of patience, love for children, passion for teaching and don’t let the passion of teaching die. ED: What would be your ideal school environment, and how would you encourage that kind of culture? RSG: Ideal environment which I would like is happy children, happy teacher, lot of noise; activities would like to see for opportunities to collaborate with parents and community. ED: What are your achievements? RSG: Achievements: I have been able to make a difference in lives of some students, create happy and progressive environment at my work place. Academically: XII Board students of Psychology scored 95% in Boards. Class X English students majority of them scored 90 above. ED: What is your philosophy of teaching? RSG: I believe in flip learning, lot of interaction and discussion in class, too way process of learning. ED: What are your accomplishment/ strength? RSG: My patience, hard­ work and love for my profession. ED: What challenges are you looking for in this position? RSG: I am looking for a lot of collaboration between parents and community and to make lifelong learners at school. ED: What experience do you have in this field? RSG: I have experience of 23 years. ED: Tell us something about your hobbies? RSG: My hobbies are reading, travelling and spending time with children. ED: Tell me what you know about this School? RSG: What I know about this School is that Fabindia is a hub for learning. Also, I am fascinated by the School’s philosophy of creating 'Happy Teachers' which in return will take care of everything else at School. I am happy to be the part of this organization. ED: What are your aspirations beyond this job? RSG: I aspire to make a difference in the life of the people around me. SR: My name is Shubham Rajpurohit. SR: My batch year was 2011-2012. SR: My batch mates were Divyant, Yogendra, Digvijay and many more. SR: My present qualification is that I am pursuing B.E. in CS. ED: Who were the favourite teachers of your time? SR: Favourite teacher of my time was K.G. sir. ED: Have you ever participated in any event, tournament, etc? SR: I have participated in cricket, basketball, football and many more tournaments. ED: What is your experience about the school? SR: My experience about my school was that to make new friends as family members, staff as parents and gave preference to school as a temple. ED: Are there any memories you want to share? SR: Yes, there are some memories that I want to share that I enjoyed participating in Annual functions, to makes jokes and learning in class. ED: Any message you want to give for your school or juniors, friends, etc. SR: Yes, I want to share message that this is the age and time when you learn things. So, do not waste your time. Vinod Parihar/ Accounts was selected as the Teacher this Week for giving three distinctions in his subject in XII Board Results. 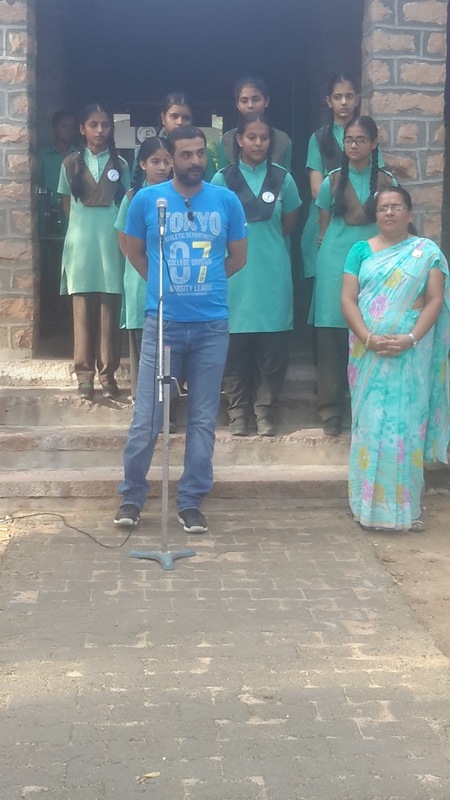 He addressed the students and told them to be confident, set up goals and work hard. VPR: Last year in August month. VPR: Deepika Tandon was the Principal at that time. ED: What type of environment is there? VPR: The environment is good and cool. VPR: Class XII & XI Commerce. ED: Are the students still in contact with you who have left the school? VPR: Some students are still in contact with me. ED: What do you expect from your students? VPR: I expect my students to progress in life and give best results and always be positive. ED: Which school have you taught before Fabindia? 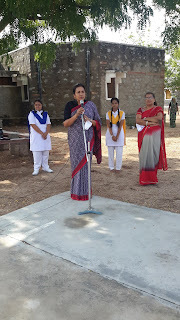 VPR: Vidhya Jyoti School Falna. ED: What message would you like to give your students? VPR: Try and work hard always. 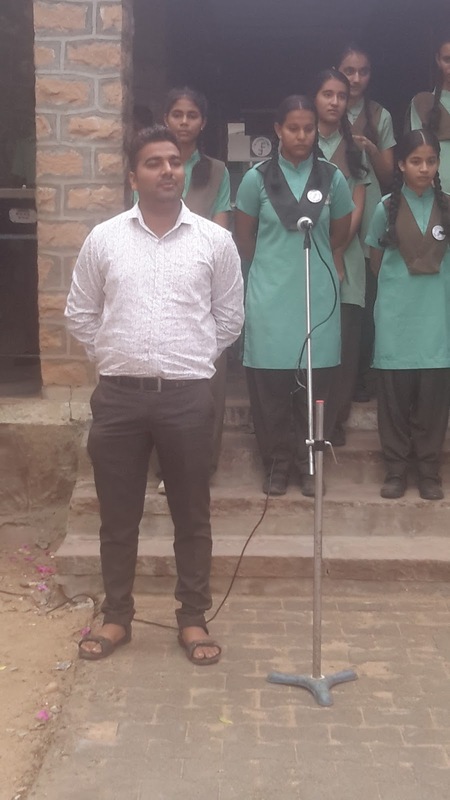 Be self confident, set up goals and put in your best. .
Mr. Ramesh Choudhary f/o Diksha Choudhary/IX and Dhawan Choudhary/V was selected as the Parent this week. He is a Lab Technologist in Bali. He is member of the School Management Committee. He addressed the students by singing a motivational song “Ek din bik jayega mati ke bol.jag me rah jayege pyare tere bol”. RC: I am a Lab Technologist. RC: Two wards of mine are studying here. RC: No, I have not achieved my goal till now but I am still on the way to achieve that. ED: What do you expect from your children to do? RC: I expect from my children to be honest all the time and to become a good Indian. ED: What do expect from the school? RC: I expect from the school to increase the sports activities and let the students maintain their fitness level. RC: I would like to give the message to the students that they should chase their dreams and never be disheartened and keep trying always. ED: How did you feel when you visited the school back as the Parent this week? 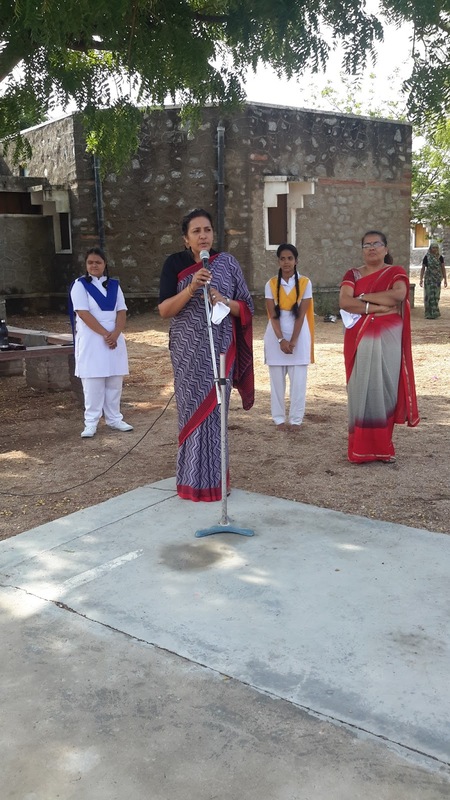 RC: Yes, it was a great pleasure to meet Mrs. Rajeshree Shihag (new principal) and I am pretty sure that she will do her best for the school. Manmanvendra Singh/ XI/DH was selected as the Student this Week for his sincerity, hard work and helpful nature. He gave the message to the students to work hard and whatever they did they should do it with dedication towards their work and to be positive. He thanked all the teachers gave him this opportunity. 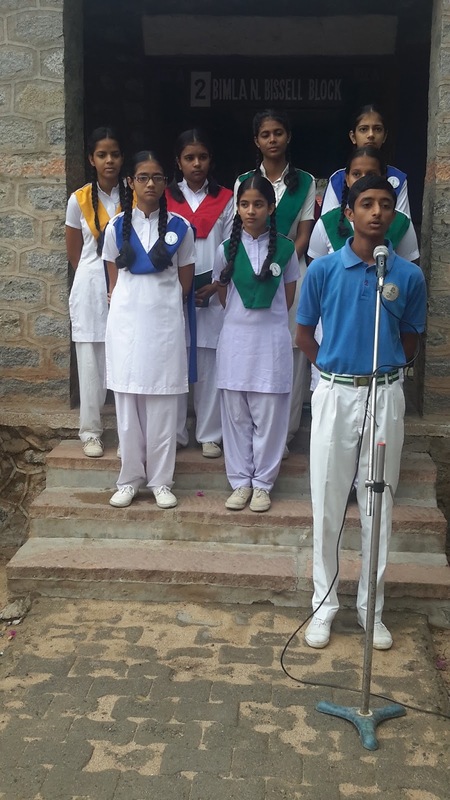 Saturday, 1st July: School observed an activity day. Sports Activities were organized for the Primary Section in the Second half. 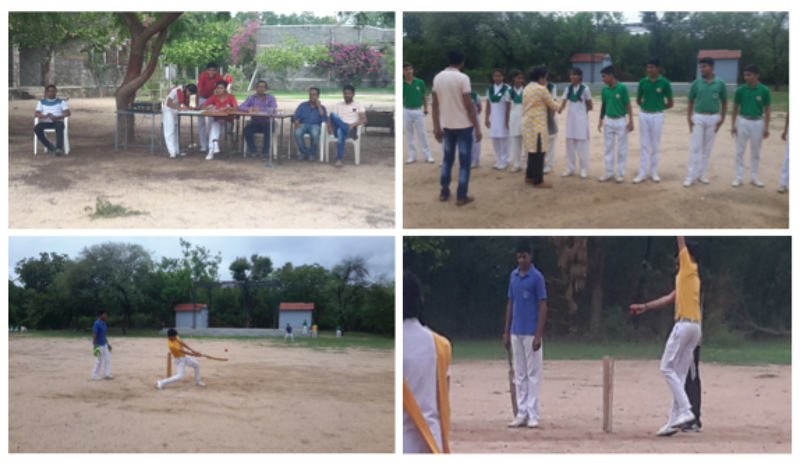 In the First half IH Cricket Match was organized for the Senior Section. Two matches were played. First match was played between Gandhi House and Raman House. Gandhi House won the match. Second match was played between Dhyanchand House and Teresa House. Teresa House won the match. The matches were so interesting and enjoyable. At last the match was organized between Teachers and Students. The match was a draw, Final and hardline will be played next Saturday.